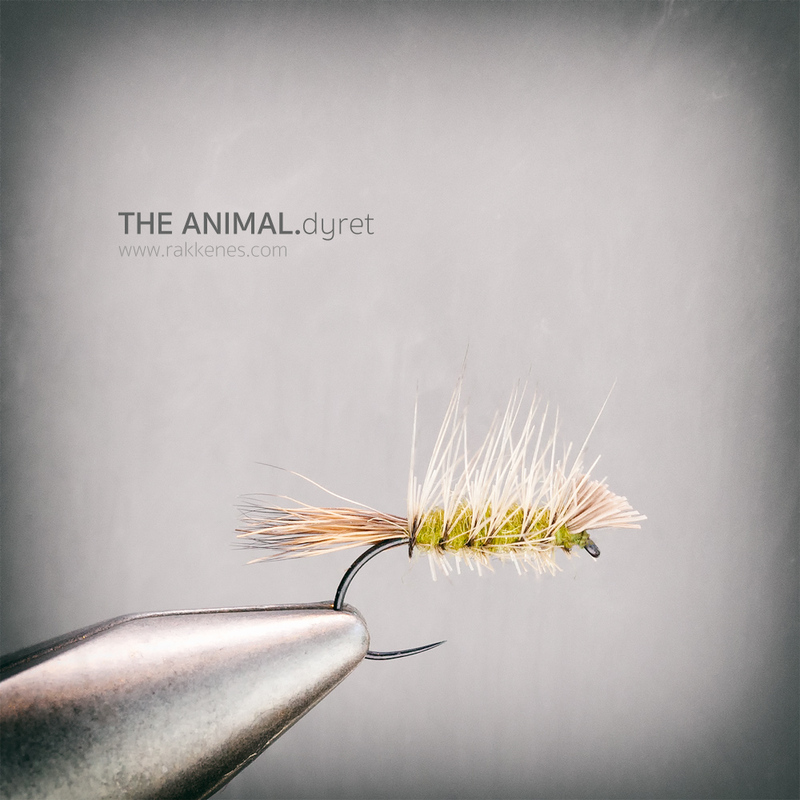 Dyret as the fly is called in Norwegian, is a fantastic caddis pattern from the innovative tier Gunnar Bingen. The fly is called The Animal in English. Although the fly is not exactly appealing to the fly tiers eye, the trout and grayling love it when a caddis hatch is on. It does not really look like a caddis, but I guess the profile has all the right triggers. Whenever you’ll see swimming pupae its time tie on The Animal. You’ll clearly see that this pattern is inspired from both the Devil Bug (re-invented by Gary Borger) and the Swedish “Superpuppan” (Lennart Bergqvist). The Animal has the profile from the Devil Bug and the palmered (and trimmed) hackle. The Animal is a pattern from Rena in Norway. The Rena River is particularly known for it’s Caddis hatches. Several great patterns have come out of these river banks, but The Animal and The Rena Caddis being the two most important. In this illustration the bug is tied with an olive dubbing, but I also tie it in black, brown and even golden amber. My favourite size is #14. Start with the body. Stack the Deer hair and tie it in from the eye of the hook. Be sure to keep the hair on top of the shank. Tail length is about half the length of the shank. Cut the head short with a slight downward angle. Tie in the hackle by the tail and twist dubbing to the thread. No taper on the body. Dub forwards. Palmer the hackle forward to the head, and secure. Trim the hackle under the shank. Apply dry floatant, such as the Dry Dip Super from Tiemco. You can also use grease-like floatant to the hackle. It is meant to be striped towards you, but it also fishes great dead drift.